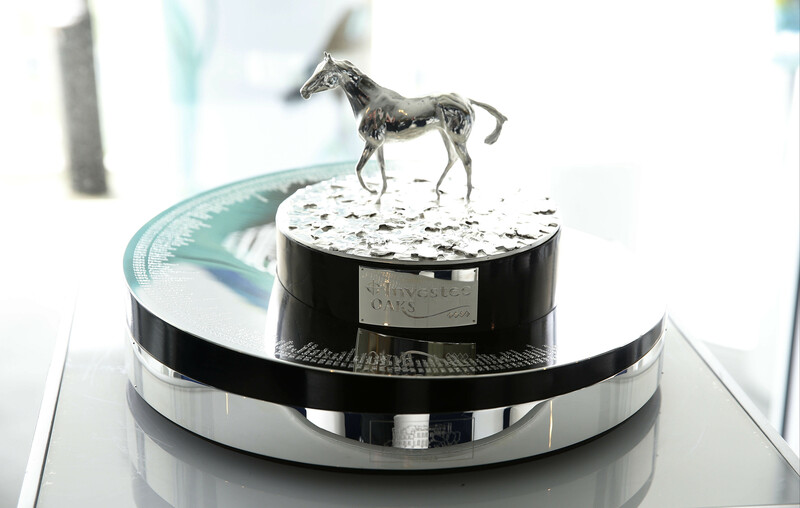 The Investec Oaks trophy. Pic: Courtesy of Jockey Club Racecourses. Legatissimo continues to head the betting as 25 fillies go forward for the £450,000 Investec Oaks on Ladies’ Day at Epsom Downs on Friday June 5. The David Wachman-trained filly is best priced at 4-1 (William Hill) but as short as 3-1 elsewhere after her victory in the QIPCO 1000 Guineas at Newmarket earlier this month where she was ridden for the first time by Ryan Moore. Moore looks increasingly likely to ride Legatissimo at Epsom and is priced at 4-5 with Coral to continue his partnership with the 1000 Guineas winner. The same firm then offer 4-1 that Found, a leading contender for the Oaks, will be ridden by Moore. “Ryan Moore could face a high class problem ahead of the Investec Oaks, with links to the first five in the ante-post betting, but we reckon he will find it very hard to get off the filly he partnered to Newmarket Classic glory earlier this month,” Coral’s David Stevens said. Legatissimo attempts to become the 48th filly to complete the 1000 Guineas and Oaks double and the first horse since Kazzia in 2002. Legatissimo’s main rival in the betting is Crystal Zvezda (5/1), an impressive winner of the Listed Haras De Bouquetot Fillies’ Trial Stakes at Newbury on Saturday who bids to give trainer Sir Michael Stoute his third win in the Oaks at Epsom. Another dual Investec Oaks-winning trainer is Ed Dunlop who prepares Arethusa (50-1), a winner of two of her three starts last season. Arethusa is set have her first start of the season at Goodwood on Thursday, in the same race that Dunlop won with Snow Fairy before she went on to win the Oaks in 2010. “We are in the position with Arethusa at the moment where we don’t quite know where we are with her so that is why we have decided to go down this route,” Dunlop admitted. “We have chosen to go back to Goodwood as she won there last year. Let’s keep our fingers crossed and see how she gets on. The Goodwood race looks pretty competitive.